" by Frederic Patenaude are little different than what you'll find in dozens of other books on the subject, but there's one important factor that makes it worth your time- The author pursues health, and his travel advice reflects this. Just what does that mean? People who are truly committed to their health are unlike the average expat traveling to exotic locales, and the specific concerns they have are simply not considered by most travel writers. Sure, there's generic advice that applies to just about everyone: how to register for a cell phone, the best way to find an affordable apartment to rent, and information on recreational activities. But the truly healthy, such as those following raw food diets, demand more. They want easy access to large quantities of high-quality, low-priced produce that hasn't been overly saturated by dangerous pesticides. They're a lot less likely to be tolerant of polluted air, and they probably want to spend some time each day outside doing vigorous exercise in a place where they're not going to get hit by a car or be forced to gulp fumes. It sounds simple enough. After all, shouldn't a paradisiacal country like Costa Rica provide for such needs everywhere? Maybe all tropical countries have that potential, but from my experience, certain places are dramatically better at catering to these needs than others. Since I'm considering a long-term trip to Costa Rica in the future, I thought I'd give, "So You Want To Move To Costa Rica," a read to see what Patenaude could tell me about living a fruit-abundant life in tropical South America. One thing, "So You Want To Move To Costa Rica" does well is compare the surprisingly divergent locations where you can live in Costa Rica and frankly discusses their ups and downs. For instance, You might want to be on the beach, but in doing so you'll experience much hotter temperatures. However, a trade off the author suggests is living in cooler high-elevation towns that are 15-minute trips from the beach. He points out that some areas are strikingly beautiful, but rutted dirt roads make them hard to reach and undeveloped. Do you want access to western amenities? Some may only be available in the big cities. Cost of living vs other tropical and western countries. A discussion of some of the negatives of Costa Rica, such as government monopolies holding back development and periodic power outages. A suggested "moving to Costa Rica" package offered by a specialist who can help you set up a life for yourself without all the hassle. So You Want To Move To Costa Rica: Worth The Money? At 166 pages, "So You Want To Move To Costa Rica," cannot be a truly in-depth guide, but serves as a nice overview of some of the best locations to check out and the factors you'll want to consider, with an unusual emphasis on the attributes important to the health seekers. There are certainly places in this book where I felt I needed a bit more information, but overall I'd consider it a good value. Whether your intention is to spend your vacation in Costa Rica, take longer trips to escape the harsh winters of your home, or move to the tropics permanently, I think the book is a good starting place for your reading. 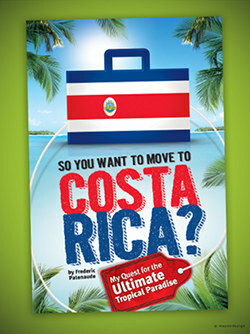 Check out "So You Want To Move To Costa Rica?" here.